As each year passes, we seem to have less of it. As we juggle the demands of a busy social and work life it can at times feel as if we are “going under”. In a desperate attempt to create more time, we turn to machines to help us with everyday tasks. Single serve coffee makers have been with us for a while but there is now a new kid on the block. Single serve coffee makers with grinders built in. We want to brew the freshest coffee, in the quickest time, in a machine that takes up the least amount of space. It won’t unfortunately feed your dog it’s breakfast! Before we delve into the pros and cons of these mini marvels of engineering, I want to look in more detail at single serve brewers. Coffee makers have traditional made pots of coffee. This was because coffee was normally made for several people at the same time or because of a hotplate, a pot of coffee would be used by individuals over the course of a day. The rise of the “coffee shop culture” and the demand to have similar quality coffee available in our homes, has meant that coffee tends to be consumed by the cup not the carafe. Single serve coffee makers are one of the results in this change. Why drink coffee that is hours old when you can make a fresh cup every time? As more of us live on our own, why waste pots of coffee when good quality cups can be made. 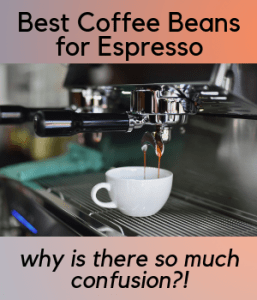 And why buy bags of pre ground coffee or bags of coffee beans (which begin to stale as soon as they are open) when we can use individual coffee pods or capsules to make a fresh cup every time? It is easy to see why single serve coffee makers are such a big hit, isn’t it? In our next section, I will look at the importance of grinding coffee. If you’ve never stopped to consider why the coarseness of the grind matters, now’s the time to upgrade. What’s so special about grinding it just before brewing? On the one hand, pre-ground beans are easier and much quicker. But on the other, buying a bag of roasted beans is cheaper per pound. Best of all, freshly-ground beans taste and smell a thousand times better. Why? The bean locks all the delicious coffee oils inside the bean. It locks in the flavour and delicate aromas. It keeps the flavour fresh. And, if you grind your own beans, you get to choose how coarse the grind is. Fine grounds are better for espresso and vacuum pots, coarser grounds are better for French presses or Percolators. Grinding yourself gives you control. And the taste difference just means there’s no contest. So grinding is important, but what are some of the pros and cons of machines that grind and brew. First off, it’s just way more convenient. You don’t have to grind separately and then load the machine. You simply load up and set the machine going. With that convenience, so the marketing will have us know, you get awesome coffee. Much better tasting than if you use pre-ground. You won’t get that stale uniform taste. The aroma is to die for. The grinding process releases the aromas, filling your house and your cup with alluring smells. The smell is already gone from pre-ground. Buying a grind and brew coffee maker will also save a bit of electricity compared to having a separate grinder and coffee maker. And finally, but by no means least, having only one machine saves space. At a time when many of us are living in smaller homes. But before we get carried away, there are a few disadvantages. On the downside, these combined machines don’t give you the flexibility of a separate coffee grinder. You can’t experiment with different grinds. You can’t use your freshly ground coffee in that nice French Press your mom bought you for your birthday. If your grind and brew machine breaks, you have effectively lost two machines. Do you buy a new single serve coffee maker with a grinder built in or buy a single serve brewer and a separate grinder? Those are the sort of issues that will keep you awake at night! In all honesty, there a few serious drawbacks that buying a single serve coffee maker with a grinder built in have. Choice- there aren’t many models available. Feedback- none of the models have particular high ratings. Each one has a fair bit of criticism. For this reason, I have reviewed an alternative. One of the most highly rated single serve brewers and a separate grinder. An important feature if you’ve not always got access to coffee beans. It gives you the option to grind your own outside. This option is the ultimate flexibility. Especially good if the grinder breaks! Don’t like messing around with complex options and control panel? Just want to crawl out of bed and press a button that makes you coffee? This is a crucial element for those of us who prefer simple operation and minimalistic design. What happens if you want to brew a little more? If you like to make more than one cup, then consider a machine than brews in larger amounts. You don’t only want to get one measly 10 oz portion! This is another popular option for many of the built-in grinders. While not necessary it’s great to have a travel cup that just slots into the machine. You can fill it up and be on your way to work. It’s just good value too. Most machines seem to have a feature that stops the grinding if it’s empty for safety. I couldn’t find much on the whole machine switching off. But most seemed to suggest they would stop working when the coffee was poured. A few machines stop automatically when the grind is finished. A crucial safety feature, so you don’t end up leaving the house with the coffee machine grinding nothing. Another thing to look out for: does the coffee machine give you the option of both permanent and disposable features. Some only allow their inbuilt filters to be used, a hassle for cleaning. Others only allow the use of disposable filters, something else you’ve got to buy. The best machines give you the option of both. It’s super convenient having all the features in one machine. But what are you missing out on that other flashier coffee-makers have? What do lose? Most coffee machines have awesome LCD displays that give timings and options for changing the temperature and hundreds of other settings. It means you can know your coffee machine is doing the job it’s supposed to. Another annoyance with many of these grind and brew machines is their lack of a removable water reservoir. Having the removable reservoir is both handy when filling up the machine, but also super useful when cleaning it. Another issue is the lack of options. What happens if you only drink mild coffee? What about if you like yours as intense as a bonfire? A strength selector is one of the most important tools for personalising coffees for different people. If everyone in your family takes their coffee differently, consider this option carefully. Only like a small cup? Want a cup as big as a bucket? This option allows you to choose how big your coffee is going to be. It gives choice for different people’s tastes. So, it makes a huge difference if your coffee machine is being shared by family or colleagues. Another interesting feature that the built-in grinder machines don’t have is the ability to set a timer to prepare the coffee. So, when you go to bed, you can set it to make the coffee before you wake up. The reason this feature is probably not included in the self-grinders is the extra step of grind is quite noisy and might wake you in the morning. The ideal choice for the coffee lover on a tight budget. Want a professional, freshly-ground coffee? Only got a few bucks to spend? The Cuisnart DGB 1FR might be the perfect coffee machine for you. It grinds and brews 16 oz of coffee beans in one go, so you can make one or two cups. Want to fit in your favourite travel mug? No problem. The drip tray can be removed to fit in a taller cup. The coffee grinder sometimes gets wet, making it annoying to clean. The whole thing is a little complex to clean. Unlike other products, it doesn’t come with its own coffee filter. You must buy them separately. It grinds coffee well and all the removable parts are dishwasher safe. If you’re looking for fast, fresh coffee, it’s great value for money. The ideal choice for the early bird with a busy schedule. Looking for that fresh ground taste? Don’t want to waste time grinding and loading the machine? 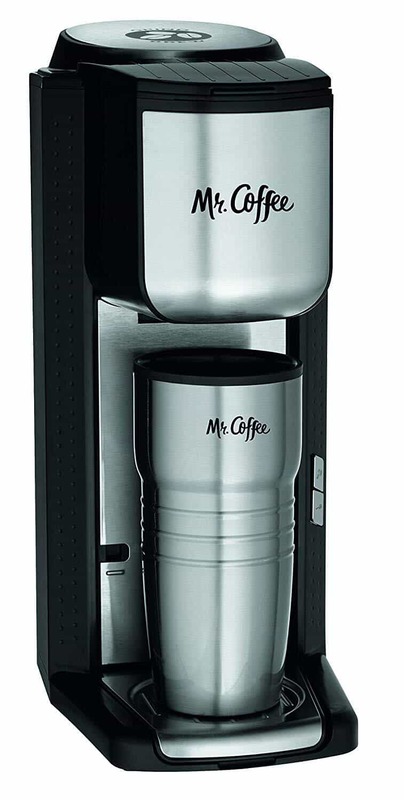 The Mr Coffee Single Cup Coffee Maker could work for you. It uses both fresh beans and ground coffee. Best of all, it comes with a matching stainless-steel travel mug. The coffee machine grinds and brews the coffee in minutes. It’s so fast and convenient if you need your fix before rushing out in the morning. The grinder doesn’t always work as well as you’d want. It leaves large chunks of unground beans, making it hard to clean. Some people have had trouble with it breaking down. Annoyingly, it doesn’t use disposable filters. Cleaning the filter is a hassle. It’s mid-range in price and well worth the money for the perfect morning coffee. Want something a bit more powerful? Want to brew two cups at the same time? The Hamilton Beach Grind and Brew fits the bill. It’s easy to operate and comes with a free coffee scoop. The big buttons on the front make it easy to use without consulting a complex manual. It even cleans itself! It has an automatic rinse, meaning you’ve only got to do the tiniest work to finish it. It allows the use of paper filters if you prefer. When the coffee’s grinding, it’s extremely noisy. So, if you make a 5am coffee, you might wake up the rest of the family. Coffee builds up in the mechanism, making it a bit annoying to clean. Overall, it’s convenient and makes delicious freshly-brewed coffee. Excellent choice if you’re busy. Want a unique an innovative product? The Zen CT Portable Coffee Maker will wow you. It’s a coffee grinder and a travel mug in one. The battery can do about ten grinds before needing recharge. Take it up mountains, across rivers, through the busy city! Add the amount of beans you want to taste and set the grinder going. 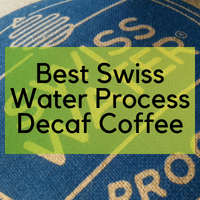 It takes 5 minutes for the ceramic burr to grind the coffee beans. Grinding stops if there’s no coffee in the machine. It makes about 10 coffees before needing recharge. Overall, one of the coolest and cleverest products out there. Perfect if you like camping or hiking and need that caffeine kick at the top of a mountain. The coffee tastes amazing too! On the one side, pre-ground beans are easier and much quicker. But on the other buying a bag of roasted beans is cheaper per pound. Do you need your cup of coffee to be done quick? Do you want a piping hot cup in your hands in under 2 minutes flat? Then the Hamilton Beach The Scoop Single Serve Coffee maker might be the one for you. It doesn’t have a grinder, so only takes grounds. But it’s one of the quickest and most reliable machines out there. It’s made of durable stainless steel and feels unbreakable. With its simple, old-school design, it’s also one of the easiest coffee-makers to use. And, it doesn’t take up much room in your kitchen. It does have problems if you overfill with ground coffee, but if you’re careful it’s fine. It brews up to 14 oz straight into a mug or your favorite travel cup. The coffee comes out scorching hot and brews quickly. It takes about two minutes to make a cup. If you want reliable hot coffee, and you already have a grinder, this is exceptional value for money. Do you love freshly-ground Arabica? Are you obsessed with inventing your own blends? Then the Mueller HyperGrind Precision Electric Coffee Grinder could be just what you need. It’s a compact, efficient grinder. It gives you full control of the grinding process. And does it quietly too. You can grind loads at once. It’s efficient and grinds to a nice fine consistency. It’s pretty basic and doesn’t have many options. But it’s simple and it works well. It is one of the most functional kitchen appliances out there. It comes with an easy-to-read guide and you’ll be set up in minutes. It’s only 7 inches tall and doesn’t take up much room on the kitchen counter. If you’re keen to get into grinding your own beans, this is the perfect piece of kit.